THAUMATROPE, a “a Twitter fiction magazine for Science Fiction, Fantasy, and Horror fiction under 140 characters,” published my micro-fiction submission yesterday. There’s no good way to excerpt from something only 140 characters long — I’m not even sure how to title the thing — and it’s probably just as quick if I provide the link: Check it out here. If you’re on Twitter, you can follow THAUMATROPE for more micro-fiction at http://twitter.com/thaumatrope. 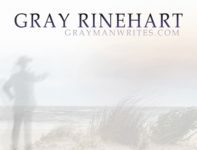 You can also follow my ramblings at http://twitter.com/GrayRinehart. Straight SF is very very hard to sell right now. I wrote back that I hope I’m first in line when that trend changes. I believe I’ve written a good book: it’s certainly the best book I could write at this time, and several early readers gave me very tough critiques that made it even better. I’ve got a great cover quote from a bestselling author, and have done everything I know how to do to increase its chances of success. Yet it is very possible that the current market will not accept a near-future, realistic, essentially hopeful SF story about colonists struggling to survive on the moon. The uncertainty of succeeding with this novel makes me wonder . . . In the grand if not the grandest scheme of things, does it matter, the success of a single person in any field of endeavor? What inventor or artist or thinker, if disease or injury or other calamity had prevented their accomplishments, would not have been replaced eventually? If not by a similar or even identical art (more likely in the realm of science than in any other), then by one that would be equally admired, equally revered? So runs the train of thought headlong to disaster. No — we must believe that our works have value for the moment and more than the moment. We must labor as if what we produce will make a difference on some scale — if not the universal, on the global scale; if not global, continental; if not continental, local; if not local, personal, even if limited to ourselves. Comments Off on Tea … and Sympathy? I haven’t gone so far as to try Twitter (I don’t think enough people would care to follow me on my mundane exploits), but I recently set up a Technorati account. I’m not exactly sure what that’s going to do for me, but “nothing ventured” and all that.